Soak the haricot beans in cold water overnight Then wash well in cold water. Trim and peel the poatoes, leeks, turnips and onions roughly chop into small pieces. Remove the coarse ribs of the cabbage and shred the leaves and put to one side. Put the other veg with the chilli, water and salt into a large pan. Add the beans and bring slowly to boiling point over a low heat. Skim off any froth as it rises and when clear add the herbs, garlic and pepper. 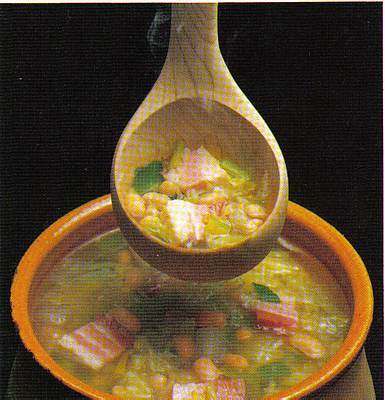 Cover and simmer for 1½ hours then add the pork and cabbage .simmer for another 1½ hours or until both the beans and pork are tender. To serve remove the chilli, cut the pork into pieces place them into a bowl with slices of bread and pour the boiling soup over them.